Archeon is an open-air living history museum in the Netherlands that hosts a yearly Viking reenactment event, supplementing with re-enactors for additional staff. I’ve had my eye on this Dutch Viking Week for a few years now, and finally this was the year we could combine a visit to family with a visit to the reenacting event. My sister has attended and vended at this weekend for many years — apparently, she’d waited until we emigrated to the United States before doing the cool stuff. Or perhaps this interest in our early history is from a more recent mindset. Neither Hrolfr nor I recall any of these events when we still lived there; it wasn’t until we moved to Florida that we encountered our first medieval faire. (And boy, did we like it!) Upon checking, I learned that Archeon is only 25 years old, and since we emigrated 20 years ago I believe the Viking Weekend and similar events really are from after our time. Arial shot from Archeon, showing the scale of the open-air museum. 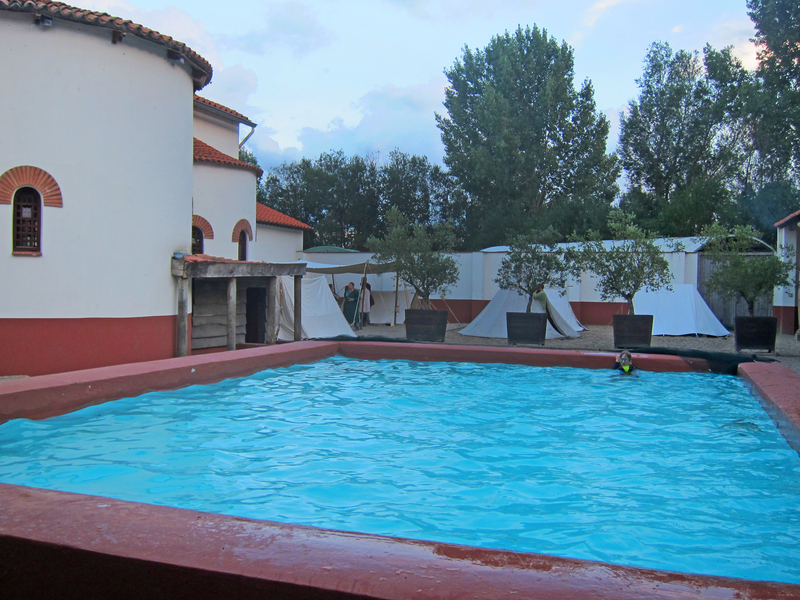 We were camped in between the two white & red Roman buildings out back. 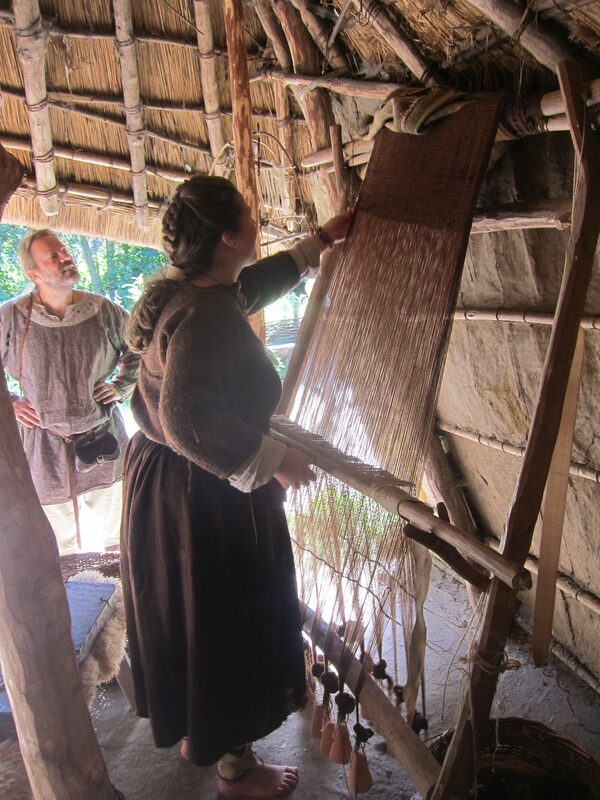 Hrolfr talking with a Bronze Age interpreter weaving on a warp-weighted loom. She lamented the fact that at her point in time broken diamond twill had not been invented yet, so she was stuck creating plain weave. 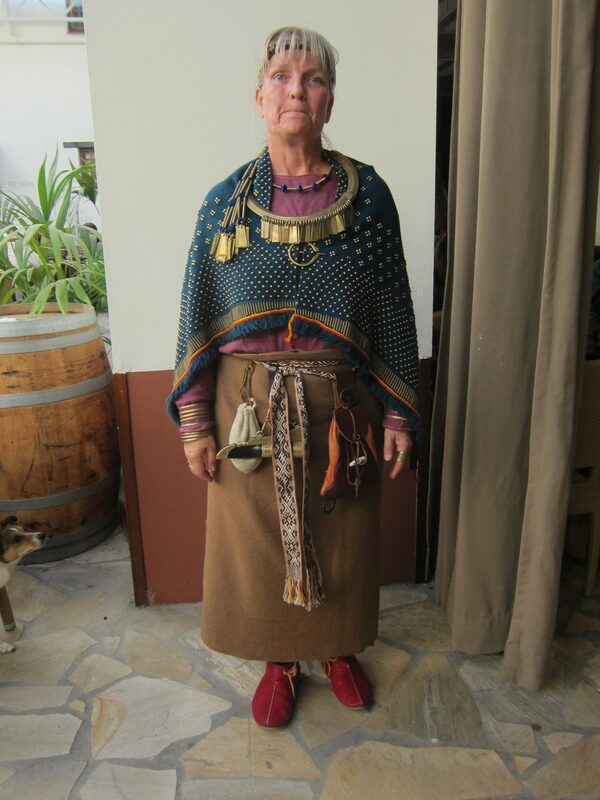 Each interpreter wore a tunic made of hand-spun hand-woven fabric in natural brown wool, which looked awesome. Each year, the Viking Week is set up smack in the middle of all these exhibits, infiltrating most of the open spaces of the Early Iron Age, the Roman Era, and the Middle Ages. 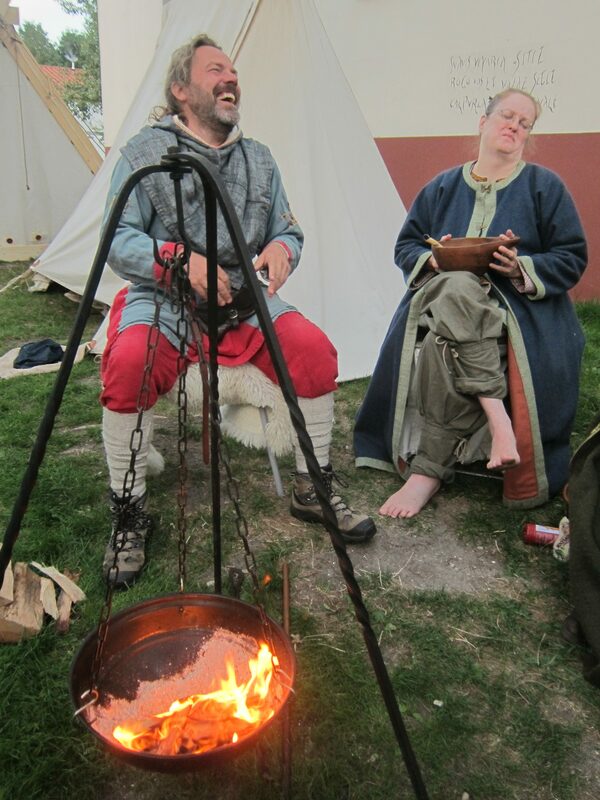 During the Viking Week, the regular living history interpreters are present and accounted for, as well as a dozen or so groups of Viking households. 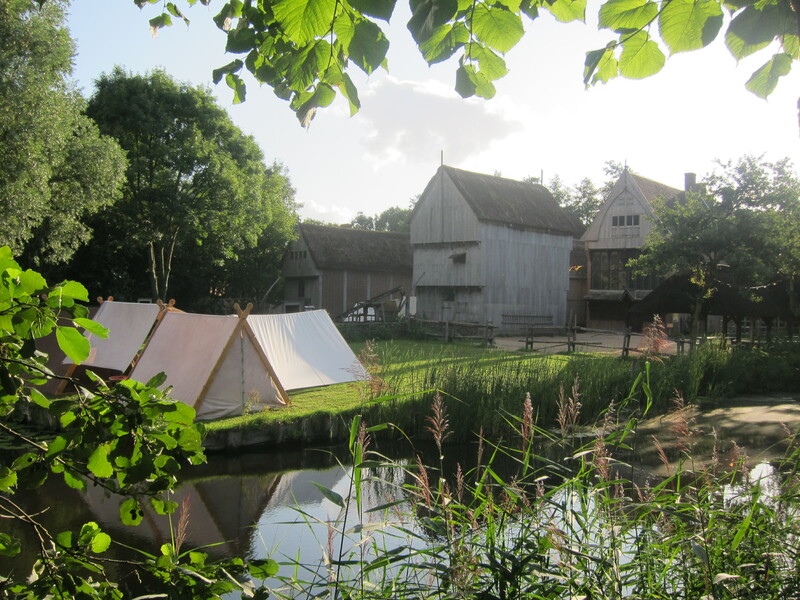 The Vikings are expected to adhere to the living history mission of Archeon, and each Viking re-enactor is expected to add, in some way or another, to the overall experience of the paying guest. Because, lest we forget, this is a museum, not an event and its aim is for happy guests, not happy re-enactors. No matter how much fun it is to dress up and talk Viking, it is done so in a job situation and everyone is on the job from 10 am to 5 pm. Obviously, since we were flying in, we had to bring in our garb by plane and chose not to bring our best outfits as I was worried they would get damaged or lost. My sister had asked permission for us to be part of her business, explaining the situation, and we had been given some leeway regarding clothes, especially shoes. We were given a 12-page document on what a re-enactor can and can not do to ensure an immersive experience for the guests. Vikings invading a 1350’s medieval town. I asked my sister beforehand how period-correct the outfits needed to be. Good enough for Ice Dragon? Or enough to pass at Pennsic? Guess I should not have worried so much. 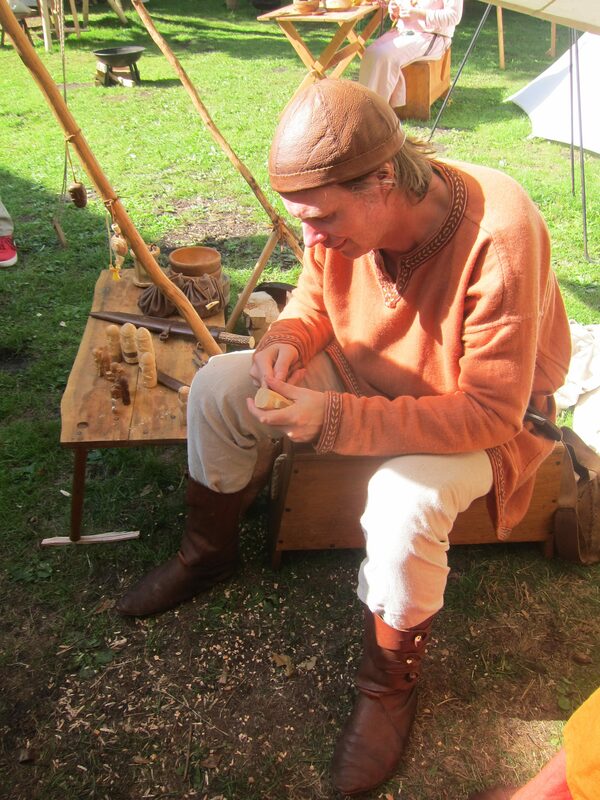 For instance, starting re-enactors may wear wood clogs at their first (but only their first) event. After that, they are expected to buy historically accurate shoes. But many of the shoes worn by experienced re-enactors were not actually period-correct; they were fantasy Ren-Faire shoes, in natural leather! Fabric seam treatments and minor embroidery was fine although not used nearly as often as in a SCAdian context. And as long as it looked like a tunic or an apron dress, it was fine. What I did notice was that the fabrics used were much nicer than I am used to and there was a LOT of diamond twill… what was up with that? Turns out most of the participants get their fabric from the same vendor, who was at Archeon as well. My sister and I went to visit him as it was my goal to bring back a suitcase of fabric this trip. 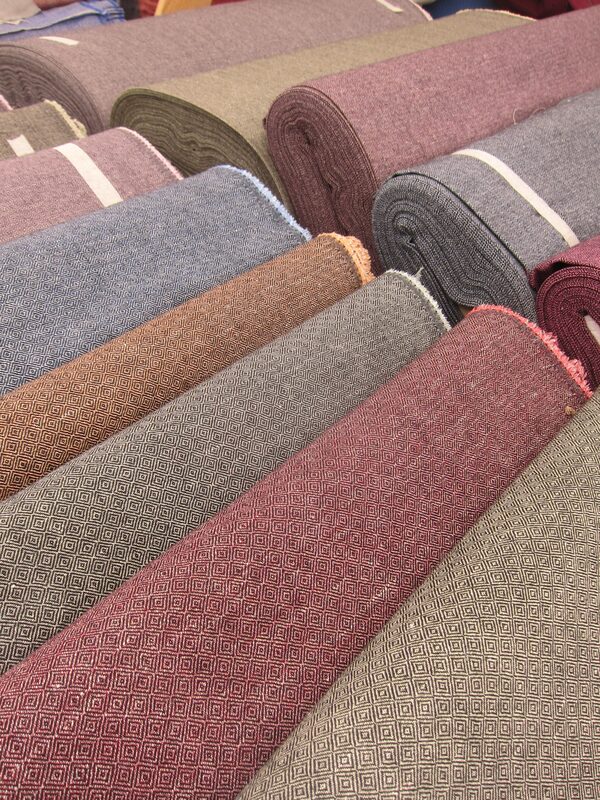 Unfortunately, his fabrics averaged €25 per meter. We had a nice chat, answered many questions about the American SCA, and shared some resources. 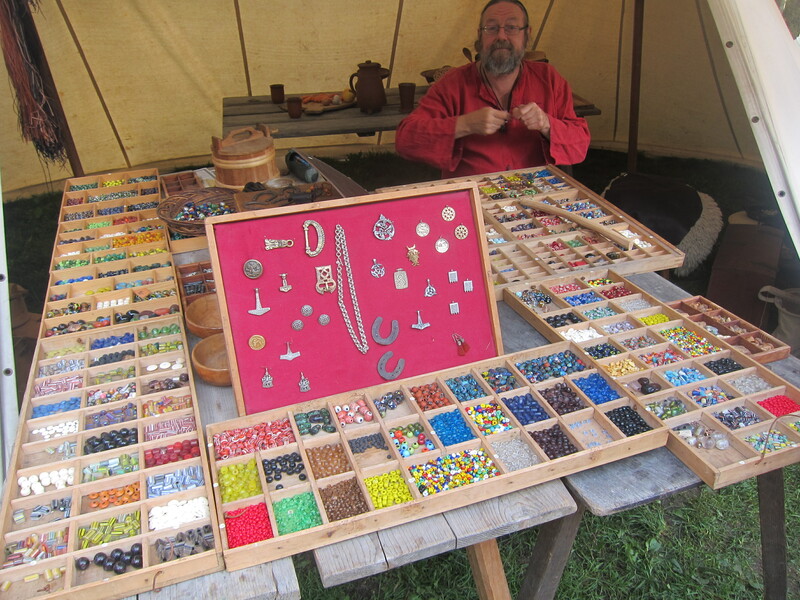 What I found noteworthy was that this vendor, who heavily influences the look of the Viking re-enactors he encounters and had much to say about how period-correct his inventory was, based his information on a bibliography barely worthy of Fleur-level research. His customers took him at his word, and were not enticed or even expected to do their own research. This is something I found across the board with this type of living history re-enactment: the re-enactors would look to the people in charge for what to do and what to use. Research was not encouraged — I mean, anyone could research whatever they wanted, but if it did not adhere to the accepted view (the 12-page book) then it could not be displayed at events. The result of this was that most of the re-enactors looked very similar to each other, and that a number of outfits were based on outdated research. The abundance of solid diamond twill fabric available and the enthusiastic recommendation of the vendor had resulted in an over-abundance of the population walking around in this, in-period but quite scarce fabric type. Nearly all of the diamond twill was two-tone to boot — and the re-enactors could clearly afford to buy it. Apparently, European re-enacting is for the well-to-do. A German family selling beads and stuff – a way to engage his kids during the “long, boring week” and help them earn Star Wars Lego. At one point, the father did this professionally; now, it is more of a keep-the-kids-busy endeavor. Curiously, it was the vendors who played with researching objects and techniques. Some vendors, like the fabric vendor, are professionals who travel the circuit. Others would play a merchant for the weekend (maybe that’s how they afforded the garb). This undoubtedly comes from the request that re-enactors have a role to play during the week and many choose the role of merchant. This request is part of the jurying process: the more you have to bring to the event, the more likely you are invited to participate and invited to return. There were also those demonstrating skills and doing chores; I loved the teenager showing off his dozen built-from-scratch pitch-glued wood arrows, his father whittling small wood saga figures, and camp mates cooking lunch for their Households. 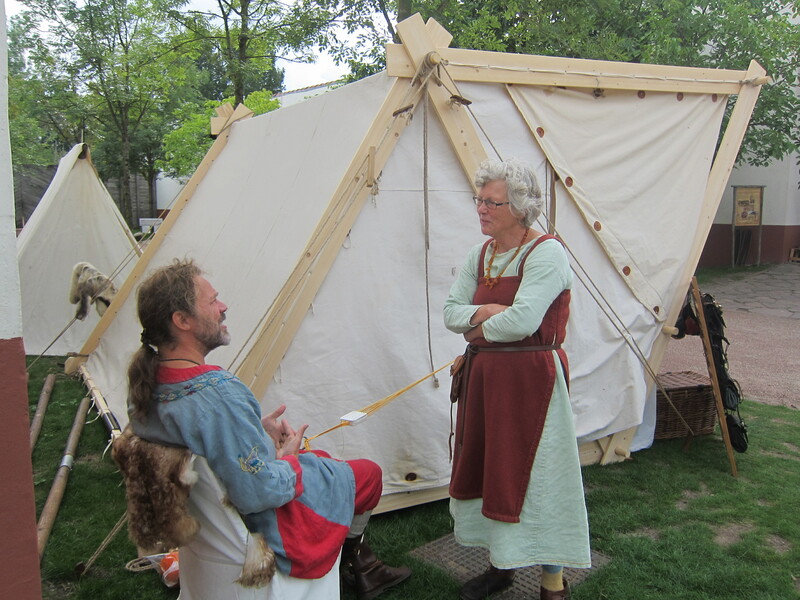 During opening hours, visitors could and would ask anything and everything from any person in garb, and each Viking and otherwise was expected to engage positively and deliver some sort of historical spiel pertaining their chore, craft, or wares. The wares for sale were of an odd dichotomy — partially geared towards fellow re-enactors and often of high quality and historical replication, and partially towards tourists. Something I found a bit disappointing was that there was not much mingling between the groups and households. It seemed like the re-enactors came to the event to play with their household, instead of coming as a household to play at the event. I can see how less out-going personalities would easily get lost without a household, if they would even get into the event. There was not much socialization even during the communal breakfasts. I had hopes for the communal Saturday dinner (not a feast, it was catered) but instead of the “mandatory” socialization after-dinner can become, the organizers hosted a trivia contest. This was fun in its own way, but by the time it was over I was ready for bed. Of course, me being me, I did get to know some people as it turned out the wife of the fabric vendor did early medieval Baltic, which I surprised her with by recognizing, and the two of use had a great time talking costume after that. Hrolfr had a similar experience — he struck a chord with another lady and the two of them had some great talks about weaving during the weekend. Hrolfr doing his tablet weaving demo and chatting about weaving. He hooked the warp between the A-frame and his belt, which worked very well. When I brought up this almost-surly attitude to my sister, she admitted that she was considering starting her own household for the company although she did not find the attitude all that unusual. Since most of the re-enactors were from all over the place, mostly Eastern Europe with some Belgians and Germans mixed in, I could not really lay blame to my Dutch culture. English was not even the common language between many households; often, it was German. And then it dawned on me: I had gotten used to how easily Americans associate! I am Americanizing. It only took 20 years. Simon freezing in the Roman Bath, with potted olive trees and some random Vikings in the background. The Baltic outfit. That shawl alone was to die for… She commissioned the shawl from an experienced weaver who took three months of weaving eight hours a day to make it. Each wire circlet and tube is woven in one by one. Did we like the event? Absolutely! And it also made me appreciate the uniqueness of what makes the SCA so valuable. Not only is it much more inclusive — to the less well-off, to the less social — it also actively encourages independent study of the Middle Ages, often resulting in academic-level experimental archaeology. Vice versa, the SCA could take some pointers from re-enacting and aspire to raise the bar at least a little bit. This visit showed me that there definitely are cultural and social differences between Americans and Europeans, let alone between period-specific re-enactors and the SCA. The Viking period-correct (-ish) camps, populated by Vikings — sans eye glasses, cell phones, and sneakers — doing Viking-y things was quite the immersive experience. It makes some adjustments very much worth it and I am totally ready for more. What’s up next? How about two weeks as a Viking interpreter at Birka, Sweden… one can dream, right? After-hours sharing of stories around the fire with family (with Roman graffiti in the background). To read more of Elska’s writing, see her blog here.